Confirmation by 3D modelling of large porphyry target at Saturn deposit, with the magnetic body measuring approximately 2km x 1km in areal extent and extending to depths in excess of 3km. PXX is continuing with its exploration field campaign at its 80% to 100%-owned Alaska Range Project, located in south-central Alaska. Work has already delineated two advanced deposits – the Zackly skarn – and the high-grade Caribou Dome sedimentary copper deposit. Zackly hosts a current Inferred resource estimate of 3.4Mt @ 1.2% Cu, 2.0g/t Au and 14g/t Au – 41,000t of copper, 213,000oz of gold and 1.5Moz silver from surface, whilst Caribou Dome hosts a JORC 2012-compliant resource of 2.8Mt @ 3.1% Cu. 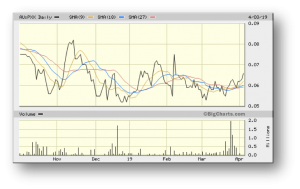 Mineralisation at both these prospects remains open at depth and along strike, with PXX pursuing a strategy of stand-alone mining operations. Meanwhile, 3D modelling has provided more firm evidence that the Saturn prospect represents a large, compelling copper‐gold porphyry target – the magnetic body is approximately 2km x 1km in areal extent and extends to depths in excess of 3km. PXX has recently announced results from 3D modelling of its Saturn prospect, which have provided further strong evidence that the prospect represents a large, compelling copper‐gold porphyry target. The Saturn porphyry copper-gold target was originally delineated by high‐resolution aeromagnetic data collected during September 2018, comprising a cluster of magnetic anomalies surrounded by a zone of magnetite destruction. 3D inversion modelling of the magnetic data has highlighted that the Saturn anomaly represents a steeply south plunging, upward flaring cylinder. The magnetic body measures approximately 2km x 1km in areal extent and extends to depths in excess of 3km (which is the lower extent of the inversion model). It is covered by 10‐15m of glacial till and is blind to surface geochemistry. The geometry of the Saturn magnetic body, its geological setting and the halo of magnetite destruction surrounding the body itself, all support the presence of an oxidised (i.e. magnetite-bearing) intrusive cluster, surrounded by a zone of propylitic alteration. 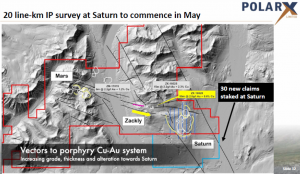 These factors, together with the proximity of high-grade copper-gold mineralisation at the Zackly Skarn deposit, provide very strong evidence for Saturn to potentially be a large‐scale porphyry copper-gold system. The scale of the prospect is exciting, but also something that will require significant exploration dollars to properly appraise. The scope of exploration funding required for Saturn would be well beyond the financial resources of PXX. 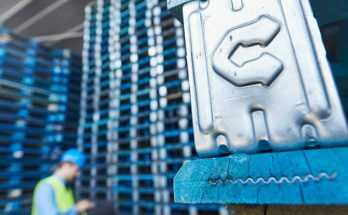 Accordingly, PXX is likely to be seeking a joint venture partner for the prospect, one with deep pockets and strategic outlook, possibly one of the world’s mining heavyweights. 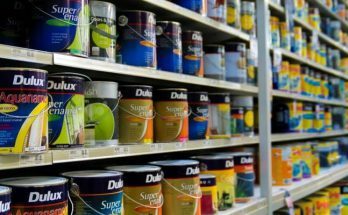 Such a partner could potentially become involves at the project level. Simultaneously, such a scenario would allow PXX to continue to progress its Zackly and Caribou Dome projects, which can be comfortably funded by itself. An induced polarisation (IP) survey will be undertaken over the Saturn target during the current quarter, covering approximately 20 line‐km of surveying. This survey is designed to locate the presence of disseminated sulphides associated with the intrusive core and in the surrounding alteration halo, and will be used in conjunction with the magnetic data to plan a drilling program for execution during Q3 2019. PXX has also staked an additional 30 State Mining Claims covering an area of 4,800 acres (19.4 sq km) in order to cover the south-plunging depth extent of Saturn, as well as providing a significant buffer. This area can clearly be seen as the area outlined in blue in the graphic above. The Alaska Range Project comprises two highly prospective contiguous projects encompassing 241 sq km – the Caribou Dome Property and the Stellar Property. They host ~35km strike length containing extensive copper and gold-in-soil anomalism along the entire length, with clear upside potential for resource extensions and larger porphyry copper-gold discoveries. The currently delineated Zackly inferred resource occurs over a strike length of 1km and already contains an estimated 41,000t of copper, 213,000oz of gold and 1.5Moz silver from surface. The mineralisation at Zackly remains open at depth and along strike at each end and provides an immediate opportunity to boost the overall JORC resource base. The near-surface high gold grades and thick, sub-horizontal geometry of this mineralisation means it could be suitable for low-cost, open-pit extraction upon an economic resource being established through further drilling and feasibility studies. PXX aims to substantially increase the current Inferred resource at Zackly, as it vectors towards a deeper and much larger potential porphyry source that forms a prominent magnetic anomaly at Zackly SE. The Alaska Range Project also hosts the Caribou Dome deposit, which comprises a JORC Resource of 2.8Mt at 3.1% copper for 85,500t of contained copper. 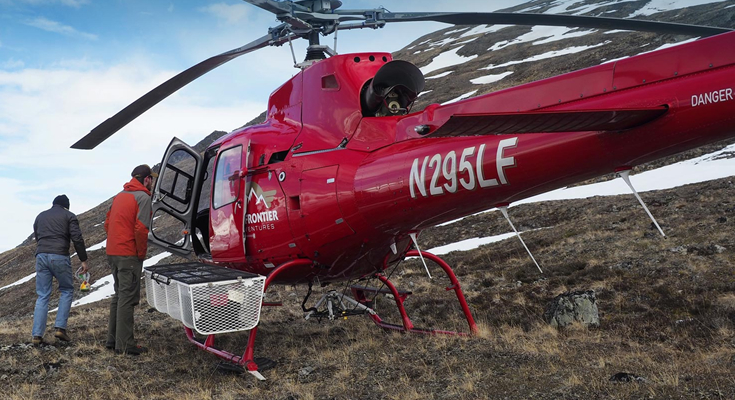 PXX aims to rapidly accumulate sufficient copper-gold inventory between Zackly and Caribou Dome to support feasibility studies on a combined operation, or one or more stand-alone operations. 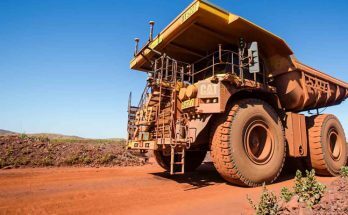 The company is pursuing a strategy of proving up resources that will have a grade/tonnage combination to justify stand-alone mining operations, whilst also exploring the rest of its acreage. Exploration to date over the Alaska Range project has highlighted its mineralised potential, with an almost continuous zone of copper anomalism over a NE-trending strike length of ~35km, with several individual priority prospects also being recognised. These prospects represent a number of mineralisation styles, including porphyry Cu-Au-Mo, intrusion-related gold (IRGS) and sedimentary-hosted copper, with exploration results from all of these undrilled prospects highlighting the potential for each to host a major deposit. Current excitement revolves around the new Saturn prospect, due to its potential scale. 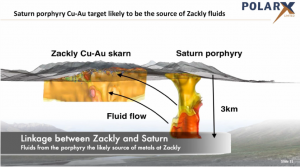 The combination of the modeling results, the magnetic responses from the surrounding zone and the close proximity to the high‐grade Zackly Skarn copper‐gold deposit, means Saturn is shaping up as a textbook example of a porphyry prospect. 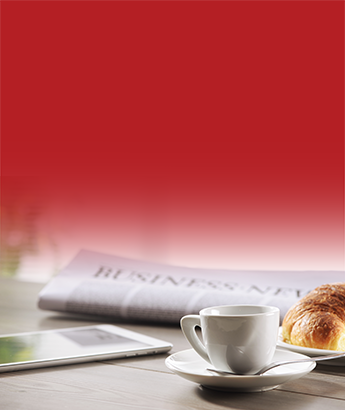 We will await further developments with great interest.